This time you've got a chance to win an item from ROMWE- a brand that Intrigue Me Now will be working with on monthly basis (worn before here and here) and while I'm waiting to get my hands on the December package that's waiting for me at home in London, I'm pleased to offer you an opportunity to win yours! If interested, a) sign up on romwe.com and b) comment on this post leaving the same email address. The winner will be chosen by me via random.org on January the 6th and will get to pick an item 80$ worth of goodies from ROMWE collection (with their current discount codes the value could be even more than that)! You've got 7 days to enter and with their cool designs being updated daily you might as well want to get started composing your wishlist (got 35 items on mine right now). Good luck and Happy New Year!!! UPDATE: Thanks to everyone who took part in this giveaway; it is now closed and the winner will be announced in the next post! 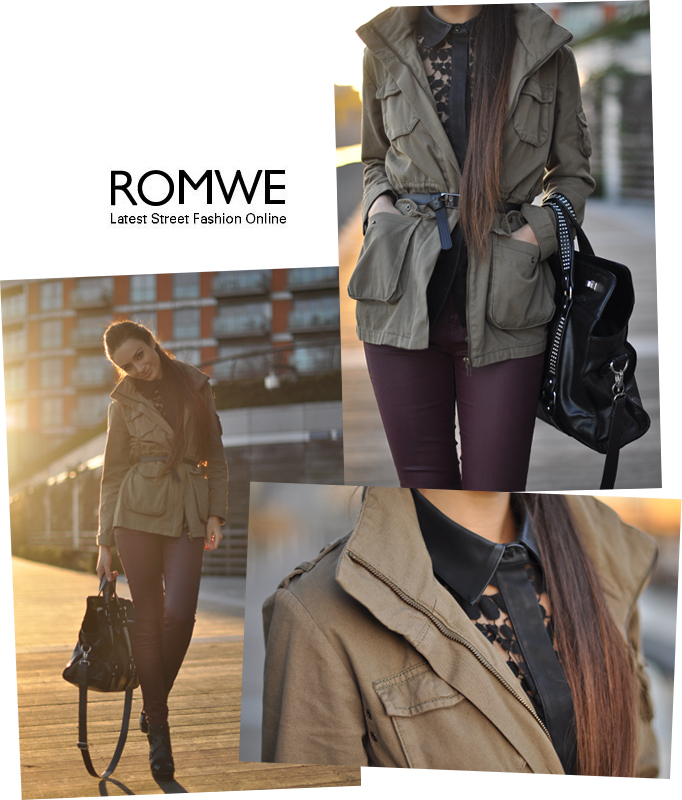 I have been joining Romwe. Wish you a very happy and jolly New Year and new place. Awesome giveaway! Would love to win! I love their bags and shoes! It's such a generous givaway, and you are gorgeous! I really love that lace and leather top with the parka jacket! love the blouse, the bag and the coat! really pretty and so gorgeous! nice! i'm signed up already! С новым счастьем, прекрасная Инга! I have singed up a few days ago :))Who knew! I simply love Romwe and I simply love to enter this amazing give-away. I can't say no to that one! this brand's beyond amazing! hope to win! Kostantina from "Eva's Girl Blog"
Thank you for the chance & Happy New Year! I would love, love, love to win! Looks beautiful on you. Ooooohhh how exciting. The lace/leather detailed shirt and the coated trouser combo works perfectly! Hello I love your blog much !!! this is amazing, i absolutely love romwe! I just started this amazign blog that is gonna change the way you style your self! I love these coated pants ♥ Thanks for this giveaway! A contest! Thank's for the tips! Winning this giveaway would be amazing!!! I never win anything! I love their stuff, hopefully i can get my hand on it. Wish me luck. Thanks for hosting this giveaway. Awesome give away, I'm in. Privet iz Ukraini!! I S Novym Godom! Love how you're wearing your coat with a belt, it's great. Hey, I just found ur blog. Its awesome. U got one new reader :). Thanks for this fantastic giveaway! absolutely love everything you wore in this post. What a great giveaway and speaking of great - you look stunning! Thanks for the opportunity and happy new year! WOW!! !LOVE THE OUTFIT!!! !HOPE IM LUCKY!!!!!! !